Topics: Publications, Publications, Church Yearbooks, and Community Publications. ns1.ezeeinternet.net, and ns2.ezeeinternet.net are its DNS Nameservers. It is hosted by Heart Internet Ltd England, using Apache/2 web server. 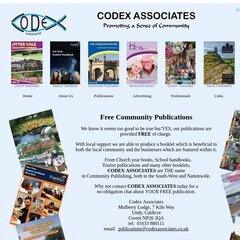 Codexassociates.co.uk's IP address is 79.170.44.107. PING (79.170.44.107) 56(84) bytes of data. Pinging the server, resulted in a 99.6 ms response.